Oh, thank God! After some concerts that ranged from very good to very bad, the Detroit Symphony Orchestra woke up and provided a concert of true excellence. Part of the credit has to go to Andrew Litton, a very fine conductor who has done spectacular work wherever he has been posted. 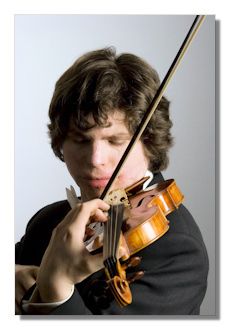 Making his Detroit debut was young Augustin Hadelich, and he and Litton collaborated on an exceptional evening. From the opening bars of the Beethoven, it was clear that things would go well. Balances were superb, with a genuine classical elegance. Works like these, that simply allow the Detroit winds and strings to steal the show, sound fabulous if everyone is willing to play this acoustic correctly. Litton clearly understood the need to create a firm, but never overwhelming orchestral framework. More importantly, Augustin Hadelich was comfortable within that framework. Playing with an assured, warm tone, he expertly handled both the lyrical and virtuoso elements at hand. Typical of a live performance, there were a few flubs here and there, but nothing alarming. Outer movements were crisp and light, with plenty of forward drive. While not matching the on disc personalities of players ranging from Heifetz to Hahn, Hadelich nonetheless proved to be worthy of his hype. I heard complaints that the slow movement was "too slow". This is silliness. Reviewing is nothing if not subjective and personal, but really, a classical slow movement should have room to breathe and take flight. Part of the genius of this particular one is the simplicity and tenderness it holds, and clipped or fast tempos do not – in my view – do it any justice. In any event, the whole performance was a beautiful one, and closed the first half. After intermission was a true Litton specialty. The conductor has already put his thoughts down on the Prokofiev for BIS, and is well regarded as a champion of this music. I'm still reeling from some concerts in which it was horribly apparent that neither conductor nor orchestra had any affinity for the music at hand; as a result, this was refreshing. Having already given us a genuinely idiomatic Shostakovich Symphony #10 a few weeks back, the transition to Prokofiev was fairly seamless. And Litton is just as persuasive in this music live as he is on record. Using mostly simple gestures, he had the winds and strings playing with a kind of brutal virtuosity. The brass also contributed positively, which is not a given with this band. As with last years' concerts, it can't be ignored how much better this orchestra seems to play under guest artists, although Music Director Leonard Slatkin has had a difficult personal year, and the weather in Detroit has been wickedly bad. No matter, this returns the Detroit Symphony to must see material.